We are celebrating Merry Monday's 200th Challenge. We have all chosen a Guest Designer to join us for this challenge. This week we have a MULTI-Challenge! You are welcome to choose one of the 4 choices....Snowman Theme, Sketch, Colours or Inspiration! I chose the Snowman Theme. 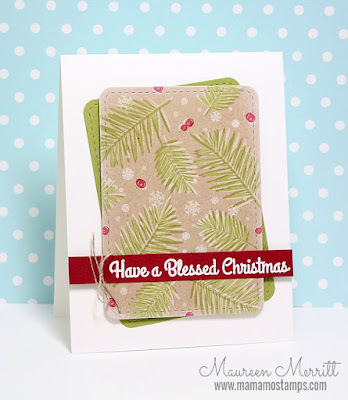 Maureen Merritt from Mama Mo Stamps. I absolutely love every single card Mo makes and I am not just saying that because she is a good friend. ;) I have learned SO much about Clean & Simple card design from her posts on her blog and also from her videos and lessons in The Classroom on StampNation which is where we "met". So happy to have her guesting with me this week! Make sure you go check out her blog to see lots of CAS eye candy. Thank you for being my guest, Mo!!!! Make sure you check out the other DT members cards & their guests over at the Merry Monday challenge blog. Kristie, your snowman is just as cute as can be! I am always inspired by your cards and your guest, so glad you invited her along, her card is amazing too!! Have a fabulous week! Such a cute snowman and a great card. Great guest you chose. Her card is lovely. Hi Kristie!!! Look at you a combo challenge, theme and the colors, YAY!!! 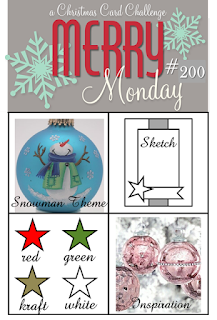 Happy 200th Merry Monday, so glad that I was able to join you all, Kristie, you are so VERY talented!!!! Yay Yay!! This is such a cute FUN card!!!! Darling snowman on the tag, Kristie and I love the details with the vellum tag, bokeh paper and stitching! Thanks for the inspiration and congrats on challenge 200!! Love your snowman card, Kristie! I am in agreement with you about Mo's cards...she's awesome to learn CAS from! Hugs to you both! This is so adorable Kristie!! Love the bright green snowy background with the bright red ... the stitching is a fun detail. Super cute snowman tag! Congrats on Merry Monday's 200th Celebration! This is so cute! I love that snowman and the stitching on the red panel. Thank YOU for having me as your guest, what an honor! mwah! Both of your cards are fantastic! Love that HA snowman! Great way to layer your tag with a vellum layer and your Guest Designer made a beautiful card also! 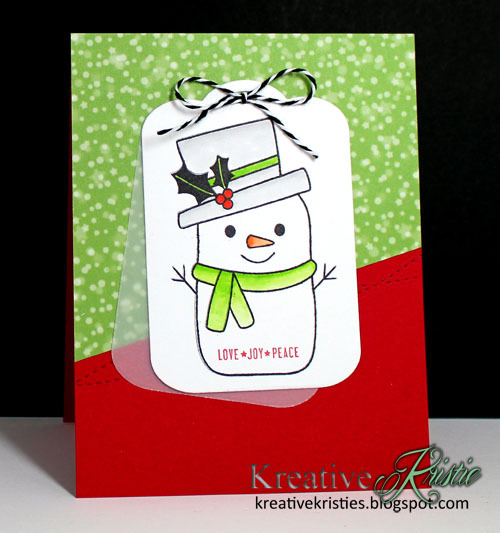 I love this snowman and the layered tags, Kristie! Love that "stitching" on the red border too! Hope you have a great week! Kristie, that little snowman is just too cute. And great card by Maureen too. Hope you have a great week. Too cute Kristie, I love your adorable snowman. Love how you colored the snowman & your layout is perfect! Maureen is an amazing designer & I love her card! You both rocked the challenge - gorgeous layering to you both! Happy Birthday for CAS(E) this Sketch! SOA Beautiful World Collection AVAILABLE NOW!!! Blessed Christmas and Magical Unicorn Dust! !